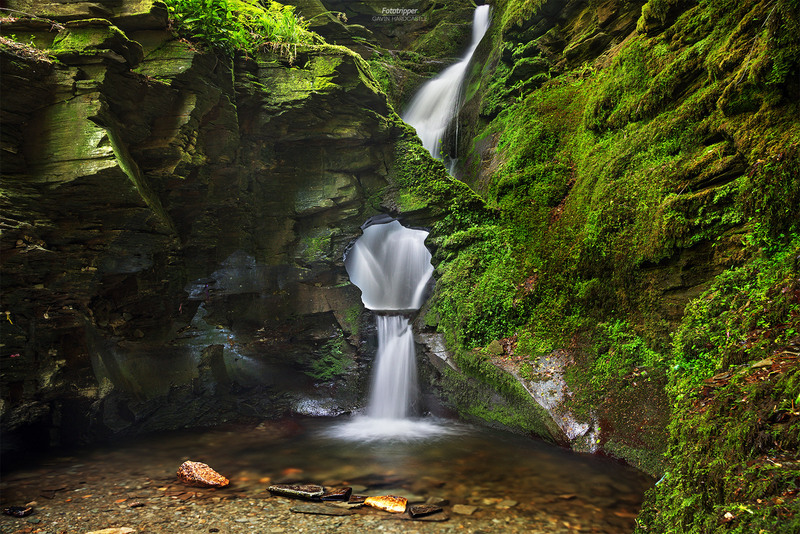 This lovely waterfall in North Cornwall, England is actually on private property but well worth the entrance fee. Aside from the obvious beauty of the waterfall itself, I was blown away by the luminous glow of the green moss. Even in the shade, the walls were aglow with such rich hues that I had to experiment with different white balance settings to get the colours just right. This was another one of those locations that gives you a great shot just by you turning up. I spent a great deal of time shooting the falls from multiple angles with a multitude of focal lengths, but my favourite shot was the very first one I took at 24mm. This was a 13″ exposure which I blended with much faster exposures to capture some of the detail in the moving water. A circular polarizer was used to capture the richest colours. I hope you enjoy the serenity and colours that I experience on this lovely summer day.